Greg Chow became a student of Maestro John DeCesare in 1980. He has been supporting and sharing John's fencing traditions ever since, first stepping up as John's assistant in 1987, and then taking over classes on John's retirement in 2010. When he's not fencing or teaching, Greg is a devoted family man, enthusiastic dancer, and dogged bicyclist, with tastes for historical reenactment, excellent food, and recurring jokes. Any advanced fencer may act in passing as an assistant instructor. Don't be surprised if someone more experienced slips out of line to quietly offer you a friendly tip for improving your grip or stance! Separately, we have three official assistant instructors registered with the FUHSD Adult School program to substitute for Coach Greg when needed. They help Greg develop drills for the beginning and intermediate groups, and frequently support Greg by supplying one-on-one instruction while he leads the whole class. Tom Conroy first picked up a foil in high school in 1976, then took twenty years off before he and his wife became students of Maestro John in 1996 — initially to escape from a dysfunctional competitive volleyball team! Tom has been a member of the Society of American Fight Directors (SAFD) and obtained an "Advanced Actor Combatant" rating. He fences all three weapons and is happy to share what he knows, but feels that his real skills lie on the social side of the Salle. "When I heard the unofficial slogan of 'drinkers with a fencing problem,'" he grinned, "that's when I knew I was home." 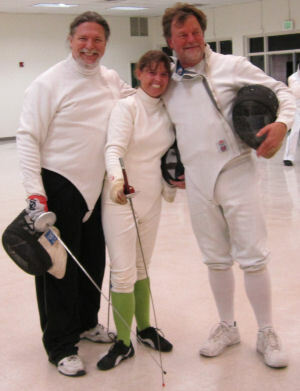 Becky took the FUHSD Adult School beginner's fencing class with Maestro John in 2008, and subsequently recruited her sister and husband to fencing. Foil is her weapon of choice. Becky jokes that her main qualification for becoming an assistant instructor was her willingness to be fingerprinted, but in fact she gives great guidance to beginning fencers out of her own recent experiences. Of the fun of fencing with the Salle, she asked, "Where else can you go and poke someone with a sword and, instead of getting told off, get told how to do it better?" 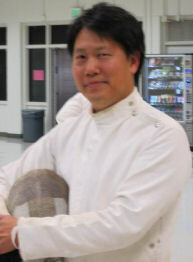 Jeff Powell began fencing in 1992, and became a student of Maestro John in 1999. He is an enthusiast of épée, the weapon that he thinks fencing "is really about." Jeff loves how Salle DeCesare shares "the lighter side of fencing" and he strives to see that everyone has a good time while they learn the fundamentals. "Just working against the couch potato thing is more than enough for most of us," Jeff said. However, he also loves to answer questions, provide guidance and supply pointers for those who want to advance and compete.